A problem was identified with the existing hot water calorifiers across the estate in terms of life expired plant and energy efficiency. This was due to a reduced hot water demand across various sites because of the reduced use of baths and some laundry services being outsourced. The plant was running inefficiently and was necessitating increased maintenance in terms of compliance with legionella legislation. Our feasibility study recommended the decentralization of plant, replacing all the calorifiers with instantaneous plate heat exchangers and modern controls. We carried out extensive demand and flow monitoring and designed and sized the new plant. This has now been installed and commissioned giving substantial improvements in energy efficiency. 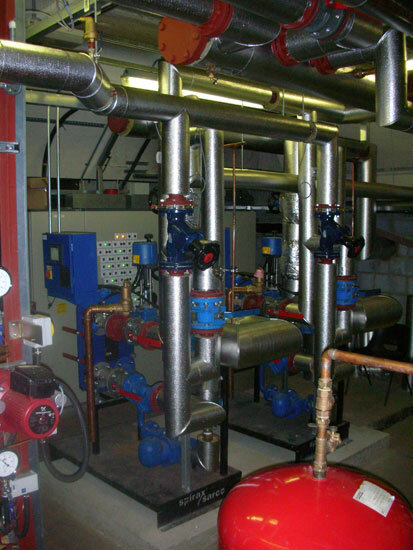 The refurbishment project reduced annual fossil fuel costs by 60%.